Our State of Mind-4" x 4" Collage, originally uploaded by DianthusMoon. I totally messed up my order for these cards and am fixing it. 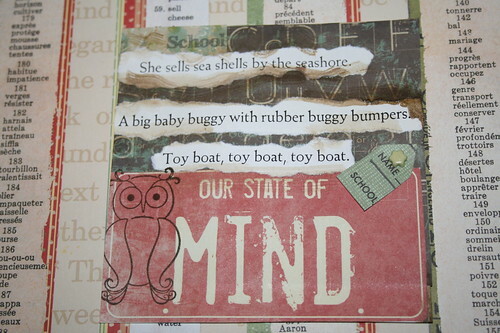 I am on a school themed roll, so I have some neat scrapbooking paper that looks like license plates-‘our state of mind’ and then added the tongue twisters from an school boor from about 1948. The owl is rubber stamped.